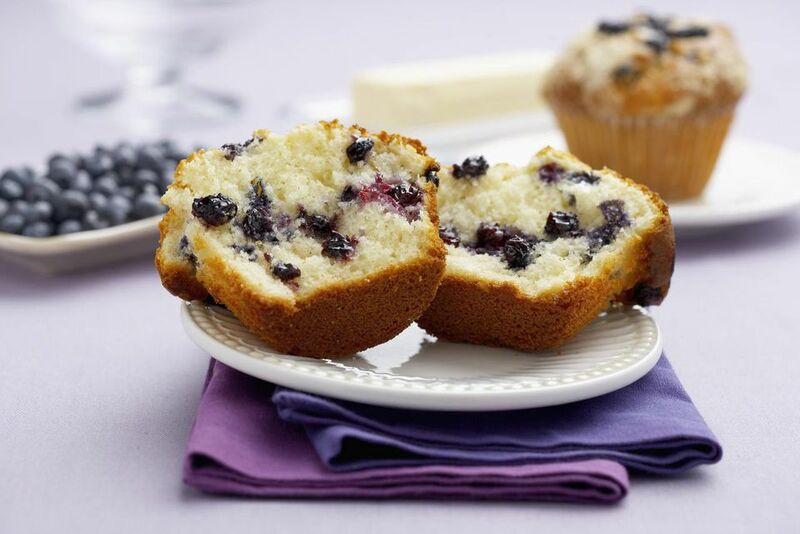 These blueberry muffins are topped with cinnamon sugar, or sprinkle the muffins with decorating sugar or vanilla sugar if you have it. Fresh blueberries are wonderful, but you may use frozen in this recipe. If you do use frozen blueberries, rinse them with cold water until the water is pale in color. Let the berries dry on paper towels until you're ready to fold them into the batter. To avoid a blue batter, fold them in quickly with as few strokes as possible. In a mixing bowl with an electric mixer, cream together butter and sugar. Add the eggs and mix well; stir in milk. In another bowl, combine the dry ingredients and blend well. Add the dry mixture to the first mixture; stir to combine. Gently fold in blueberries. Fill the greased muffin cups about two-thirds full. Sprinkle tops with some sugar. Bake for about 20 minutes, or until the tops are lightly browned.